Change can come about through the values of honesty and hard work. 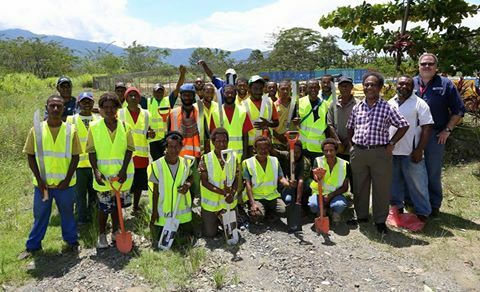 This was the message given toyouths living along the Milesarea outside of Lae City, during a presentation of tools by Wafi-Golpu Joint Venture. The company through an initiative by the Miles Law & Order Association, and local businessman Bernard Maladina, has engaged youths to cut grass and clean around its property at 9 Mile. WGJV General Manager Sustainability & External Relations, David Wissink, when presenting the tools to the youths, said WGJV wants to see the youths involved in positive activities to keep them away from crime. “This is a small opportunity we want to assist you with so you can become useful and contribute meaningfully to your community,” Mr Wissink said. President of the Miles Law & Order Association, AndrewKuno, reminded the youths of the importance of the engagement. “Sitting at the desk in front of a computer won’t change you. This job, grass cutting and cleaning, will change your way of thinking. So let’s work together andthank you to WGJV for giving us the chance to prove that we are willing to change when opportunities like this are given to us,” Andrew said. Bernard Maladina, who runs his consultancy business, Niugini Strategic Services, said he grew up at 4 Mile and understands the struggle the youths face on a daily basis. “I encourage you to leave the guns and crime and get into activities like this. This is a small job but it will lead to many more opportunities in the future. Don’t waste an opportunity like this, this is your chance to make a difference and sustain yourselves,” Mr Maladina said. Youths representative, KaksWena, thanked WGJV for the support. “Many of us do nothing and end up in crime. So through the Law and Order Association we now have this job and we will make the best of it, because we want change and want our children to grow up in a good community,” Mr Nena said. The Law & Order Association has been active this year by promoting its crime-free initiative particularly in areas from 1 Mile towards 9 Mile. 1. Youths with tools – Miles youths with WGJV representatives in front of the company’s Core Shed property, 9 Mile.